I suppose there are few people who do not have an image of Auschwitz, especially people our age. We have seen the photographs. We have read articles and perhaps books. We know it was awful and horrendous. But it is also true that you really do not get the complete picture until you see it first hand. You stand in the gas chambers where toward the end of the war more than 20,000 persons a day, mainly Jews, were being murdered. You stand where the medical official separated those who went immediately to the gas chambers, almost all the women, children and elderly, from those who would be given a reprieve of weeks or perhaps months to do the dirty work—remove dead bodies from the chambers, clean the latrines, construct more barracks, or anything else they were told to do. These “lucky ones,” mainly boys and men between 14 and 40, worked at least twelve hours a day, got soup and bread to eat if they were lucky, and usually died of exhaustion or starvation within weeks. You see the torture chambers where “unruly” prisoners were put into tiny cells with no light and suffocated or starved to death slowly. You hear that one of the chief factors for using gas to kill the prisoners in addition to being more efficient was that it was more painful to the victim. Considerable effort went into perfecting the technique to enhance the pain inflicted. The procedure which they eventually settled on took and an average time of around 20 minutes to die. Those who were still alive that time were shot. 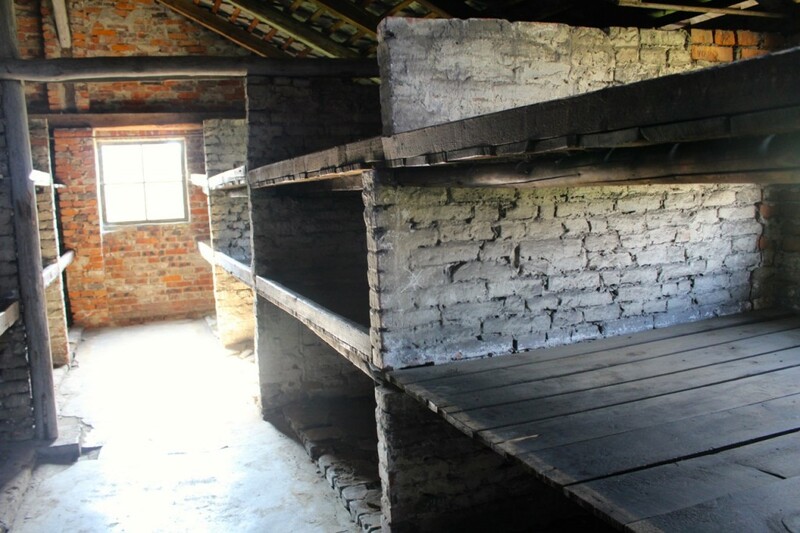 You look at the bunks—wood or concrete, no mattresses or padding– where perhaps three people could have managed to sleep uncomfortably but were routinely occupied by six or seven. You see the mountains of shoes, the tons of hair, the prayer shawls, the piles of suitcases and the photographs, which are the most chilling of all. 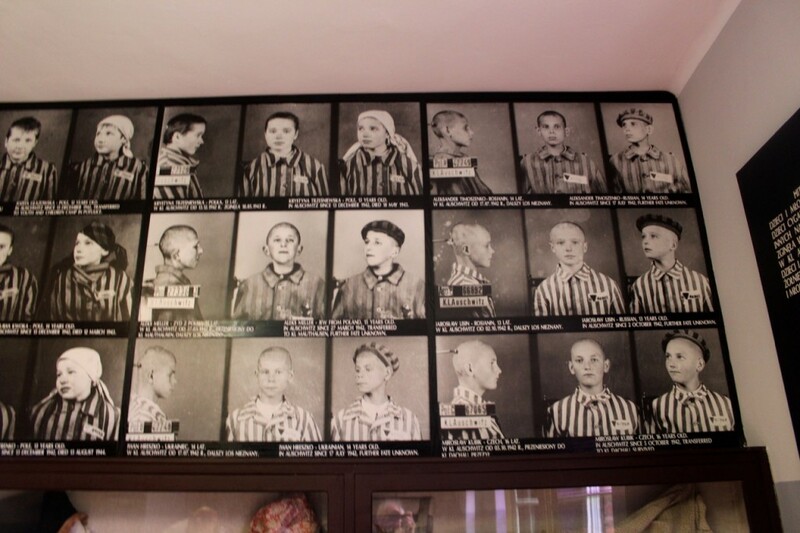 All prisoners were photographed upon entering Auschwitz. There they are: kids who would have been in school or on the playground. Mothers and fathers, grandparents, just normal people whose only crime was being a Jew (or gay or a gypsy or physically handicapped or mentally ill). There was no room for these “misfits” in the Super Race that Hitler intended to create which would rule the world for a thousand years. At its height, the Auschwitz death-machine accommodated on any given day over 90,000 people in two locations less than a mile apart. There were more than 4,000 guards and police there each day keeping them in line. One million deaths were officially recorded between 1941 and 1945. The actual number was closer to 1.5 million. In the various camps located across Nazi Europe, over six million Jews were murdered, more than half of all the Jews in Europe. By 1945 Hitler was well along the way to eliminating the entire Jewish population. Had the US not entered the war and had the Allies not defeated the Nazis, he could well have succeeded. Yes, we all know this story. But actually being at Auschwitz, seeing it with your own eyes and walking in the same paths as the prisoners did–well, it is different. Of course, the big question is how could this have happened. This was not the Middle Ages. This was not a “backward” country. This happened just over 50 years ago in one of the most advanced, most well-educated parts of the planet, a region which had produced the world’s greatest music, philosophy, theology and art. It happened in an area that was officially Christian. When we look at what is going on in Syria and elsewhere in the Middle East and north Africa and conclude that “those people” are barbarians, let us not forget the Holocaust. For “Westerners,” this happened on our watch, in our back yard, not in some remote, “backward” area. This is our legacy. I have to admit that for years I have been prejudiced towards the Germans. The German population elected Hitler in the first place and acquiesced as the rules of the game changed. They may not have had all the details; but they surely knew Jews were disappearing from their communities and going somewhere. Why didn’t they rebel? Why didn’t they overthrow this maniac, this demon? What was wrong with the Germans? I now do not see this as exclusively a German problem but rather a human one. The Germans are not any different from the rest of us. We humans are herd animals. We may complain about politics, but we need leaders and ultimately we follow them. That is just the way we humans are. We live our own lives and let the chips fall. If an action does not affect us personally, most of us simply go about our daily lives. We don’t fight back, especially when the consequences to us and our families may be dire. The problem with Germany was they got Hitler. That is why leadership is so important and why good leaders ultimately make all the difference. I know it is not only leaders, but that surely is part of it. But to be honest, I am stumped. 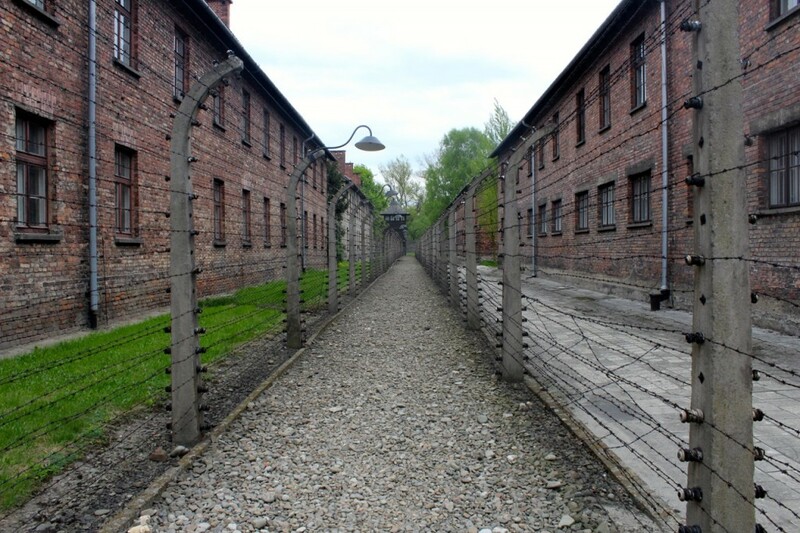 Why do we live in a world where the Holocaust happened? Where does God fit into all this? How can God be all powerful and all good? Why is the church more often than not a bystander and upon occasion an enabler of really bad things? There are no answers, only questions. This is the human condition. Very powerful questions. Thanks for sharing them. I read this glued to every word. Every one mattered. Thanks. Wow Joe, best words i have read on the subject – and i confess i didn’t know the extent of those horrifying details. A profound question. About being herd animals. Seems to me a lesson is: be very very wary of the herd – never stop questioning. And then there’s your point about complacency. I can push myself to be more questioning (in many of our natures) – that’s relatively easy. But acting on those questions radically against the herd is way more difficult. I think the world would be a better place, for example, if i came out more radically on climate change, in ways that were disruptive to my happy herd life. I am convinced that climate change which will kill millions, mostly poor, marginalized – already linked to Syrian conflict (deepest drought on record) among others (ask me more if curious) but like the frog in the pot, gradual, hard to call a threshold. perhaps i overdramatize, but seems to me analogous to Germany’s history, now at global scale. so, i go with the incremental push, just nudges, which i fear won’t push through barbed wire fences along our path. hope to talk more. No answers but you just have to keep trying. You and Peter are lucky to be on the cutting edge of the most important issue of our time and are making a difference! Powerful essay, in particular your last paragraph. As we travel less developed parts of the world and see first hand the suffering of the innocent, we increasingly ponder the questions so splendidly posed by you. Your intellectual honesty is quite refreshing. Thanks so much for your kind comments. Russian posts are coming up.Some big time surprises here, not all good. Thanks for your insightful travelogue which we always look forward to reading. Point of information: the Germans never elected Hitler, who was defeated by Hindenburg in the 1933 election. Thanks, Calvin. You remember more from your history classes than I do. You are correct. He was not elected buy rather appointed though at the time Germany was democracy. Will correct. Thanks, Hank. Sounds like required reading. Good luck racing this year. I will surely miss it.